I had a busy day and could only get one small task accomplished on the road to Thanksgiving. I started curing gravlax. Once it’s finished, in 2 days, I’ll pop it in the freezer until Tuesday before Thanksgiving, when houseguests arrive, and this gravlax will be an elegant, simple appetizer to offer up with cocktails that first night. Gravlax is delicious for appetizers, but also perfect for breakfast. Or even seductively draped over a beet salad, as I recently tasted at a thrilling Artisa Kitchen dinner. Rinse and dry the salmon. Examine for pin bones and remove any you find. In the food processor, add all the fronds of the dill (not the stems). Pulse a few times, then add the salt, sugar and pepper. 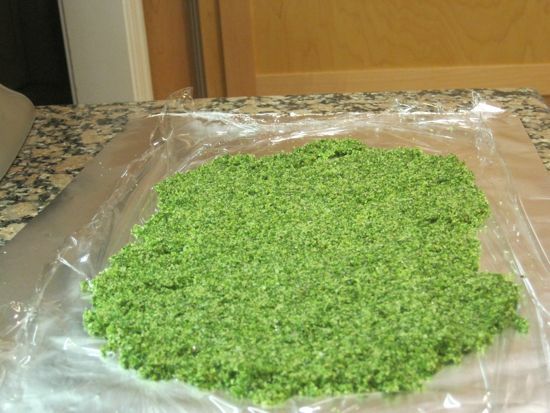 Grind all the dill into the sugar and salt, then add the vodka to make a loose paste. Set up a large piece of foil with a large piece of plastic wrap on top of it. 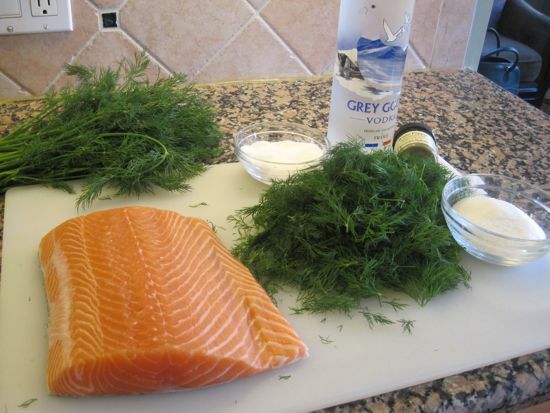 Dump out all of the dill paste on top of the plastic wrap and smooth it to the same dimensions as the salmon. 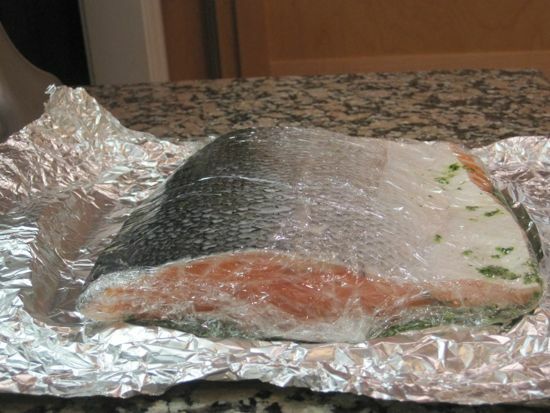 Place the salmon flesh side down on the dill paste then wrap the fish tightly in the plastic, then the foil. Place this package in a zipper bag and into the fridge. Turn the fish over every few hours for the next 2 days. Unwrap the fish after 48 hours and scrape off the dill paste. Not obsessively, as it’s nice to have a thin green dilly edge on the sliced gravlax. Dry the fish in paper towels. To serve, slice paper thin, on a slight edge, cutting away the skin. Put mustard, sugar, vinegar and oil in a small bowl and whisk until it begins to emulsify. Stir in the dill and refrigerate overnight. I’ll have to try it your way… our simple scandinavian recipe is just less processed: two pieces of fish, equal amounts of salt and sugar (about a cup) rubbed into both sides, whole pieces of dill between the layers, wrapped then weighted with a brick in the fridge for two days… delicous! Do you slice before freezing, or afterwards?